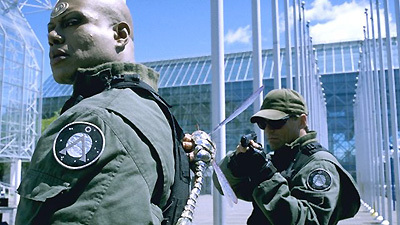 The cities of BP6-3Q1 are deserted except for giant insects which attack SG-1 and sting Teal'c. Back on Earth, Teal'c begins a horrifying metamorphosis as the insect venom begins transforming his DNA into its own. Colonel Maybourne arrives to take custody of Teal'c, seeing the potential for biological weapons in the venom. However, Teal'c escapes and, befriended by young Ally, hides out on the streets of the city. Meanwhile the rest of SG-1 returns to the planet to retrieve another insect for study as they frantically work to find an antidote and to find Teal'c before Maybourne does. The original inhabitants of the planet were human, possibly from Earth, and with a level of technology similar to Earth, but they were wiped out by the alien insect. Carter worked with Dr. Timothy Harlow, one of the world's top geneticists, when she was at the Pentagon. The venom from the insect transforms the DNA of the victim, causing a metamorphosis into numerous new insects through equal matter conversion. Each human would become approximately ten new insects, causing swarms in the millions in six to eight weeks. The metamorphosis was reversed using experimental RNA inhibitors in conjunction with the symbiote's natural healing abilities. Teal'c's symbiote was kept alive by synthesizing the environment of his pouch, including temperature, nutrition, and a low level electrical current from D-cell batteries. Maybourne ordered the insect and all related research transferred to the Area 51 facility. However, following Teal'c's recovery, the insect will be involved in an unfortunate lab accident for which Dr. Harlow will take full responsibility. Witness if you will... a ghost town. Let's say you owe me one, like in the Godfather. All that top secret James Bond stuff.